Doug McIntosh is undertaking a series of cycling events to raise money for his 4-year-old grandson. Picture by Kenny Elrick. An Aberdeenshire man who has overcome trauma and tragedy through cycling is gearing up for a gruelling series of events. Doug McIntosh’s son Scott took his own life in February, aged just 28. In memory of his son – and to raise money for four-year-old grandson Riley, Mr McIntosh is undertaking three cycling events. Last weekend, he completed Ride the North with hundreds of other charity cyclists. And next weekend, he will do the Big Belter from Glasgow to Edinburgh. The two challenges are helping him build up to a cycle that has long been on his dream-list – the Stelvio Pass, in Italy. 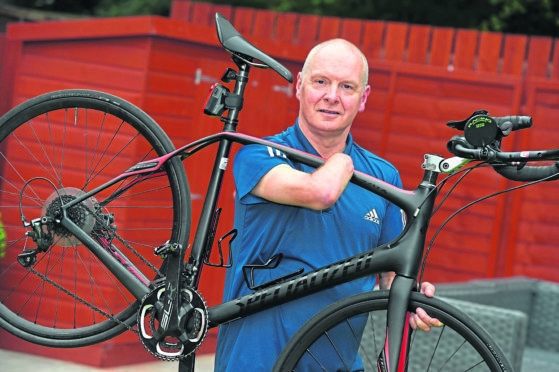 Mr McIntosh first got on his bike 21 years ago to deal with the trauma of having his arm amputated due to cancer. He said: “Cycling has been a healer for me, I literally used it to get over the trauma of losing my arm, and then again after losing my son. “It lifts me, it’s an escape and it’s been very helpful. “I have never endured such pain in my life as I have this year and now want to get myself motivated and do something very close to my heart. Mr McIntosh, from Westhill, has previously cycled from John O’Groats to Land’s End twice, and has even conquered the Club des Cingles du Mont-Ventoux, at 13-mile with a climb of 5,314ft – the hardest of all the major French and even European passes. He said: “Climbing is the biggest challenge, especially one-handed. “It can be really extremely tough, but funnily enough it’s what I enjoy most.